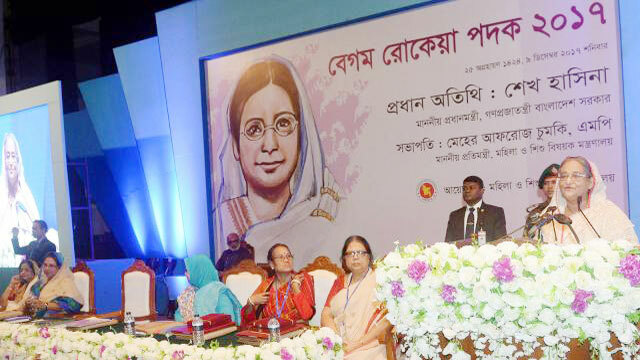 Dhaka, Dec 9 (Just News): Prime Minister Sheikh Hasina today urged the country's women to discover their own potential and value defying all the odds and obstacles to stand on their own feet. "Women always think how can they flourish their merit and potential...they have to take their own initiatives, they must not dependent on others. There'll be obstacles and hurdles, but women have to move forward overcoming all those," she said. Sheikh Hasina said this while inaugurating Begum Rokeya Day and distributing Begum Rokeya Padak-2017 at Osmani Memorial Auditorium in the city. The premier said this is not possible for men alone to build a society with their own efforts. "It's not possible to build a sustainable society keeping the women aside," she said. Hasina said in a society where women constitute half of the total population that cannot go a long way without the contributions of women. "So, all are needed equally to build and develop a society properly." She also urged all irrespective of men and women to devote themselves to the development of the country. The Ministry of Children and Women Affairs organised the programme with State Minister for Women and Children Affairs Meher Afroze Chumki in the chair. Women and Children Affairs Secretary Nasima Begum delivered the welcome address at the function. Recipients of the Rokeya Padak-2017 Freedom Fighter and organiser Mazeda Shawkat Ali also spoke on the occasion.